January 2018. G-protein-coupled receptors (GPCRs) are the most important signal transducers in higher eukaryotes. GPCR subtypes are closely related receptors with high sequence similarity, but they can differentiate between sets of ligands that are highly similar in structure or sequence by binding to them with substantially different affinities. Despite major recent advances in understanding the molecular basis of GPCR signaling, the foundations of subtype selectivity, especially for peptide ligand GPCRs, remained poorly understood, which hampers mechanistic understanding and rational drug design for peptide receptors. 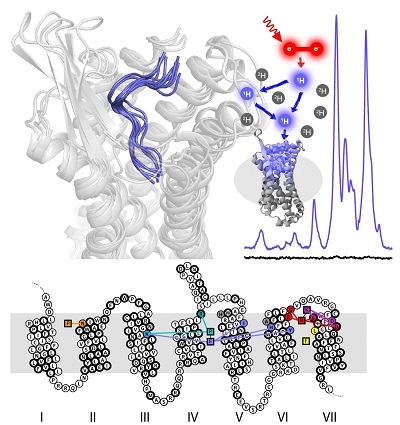 The detailed molecular picture obtained by this study opens a new gateway for exploring the complex conformational and chemical space of peptides and peptide analogs for designing GPCR subtype-selective biochemical tools and drugs.